After being surrounded by his loving family for his last few days, retired Lt. Colonel Edward G. Latham, Jr. died peacefully on July 30, 2018 in his Santa Rosa Beach hometown. His humor, his dedication, and his extraordinary ability to fix almost anything will be sorely missed by his family. He was born and raised in Birmingham, Alabama. He attended Auburn University, where he met the love of his life, Carolyn Ennis Latham of Tallassee, Alabama. They married in 1952 after graduating with Engineering and Teaching degrees, respectively. Ed joined the Air Force immediately after graduation and was assigned to Eglin AFB where he spent much of his 28-year Air Force career over 3 separate assignments. Ed spent much of his career as a navigator in the back of a B-52 Stratofortress. During the October 1962 Cuban missile crisis and as part of the Strategic Air Command (SAC), Lt. Colonel Latham flew from the US mainland to the Russian border, aided by in-air refueling, with multiple nuclear weapons on board. Once in the area of the Mediterranean, they remained airborne for several hours waiting for a command to attack their designated target, Moscow, should there not be a satisfactory outcome to the crisis. After nearly a month, the crisis abated and the nuclear armed B-52’s returned to regular duty. A year later, the USAF sent Ed to the University of Chicago where he earned his MBA. From there, he returned to Eglin for most of the remainder of his career. He spent 1968-69 in one of the most dangerous bases in South Vietnam, Pleiku, flying an O-2A reconnaissance plane responsible for directing air strikes against North Vietnamese targets. The plane flew at such low altitudes that it required a metal-reinforced pilot’s seat to protect from small weapon fire from the ground. 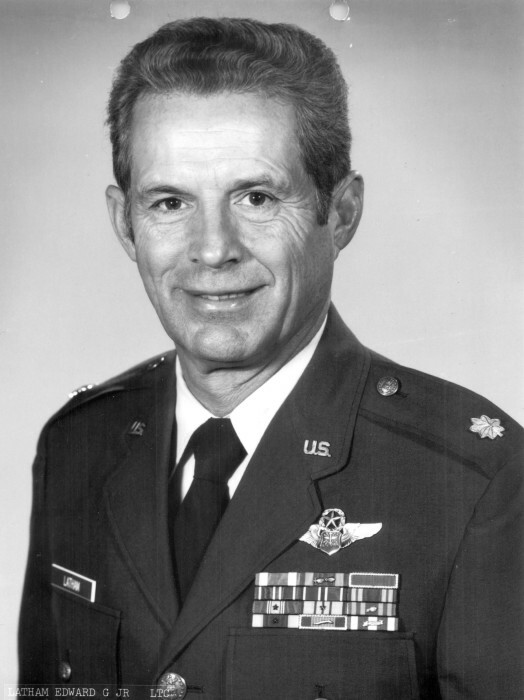 After a stint at Pope AFB in Fayetteville, NC, Ed finished his career at Eglin, with responsibility for developing and executing the operating plan to aid tens of thousands of South Vietnamese refugees in Eglin’s “tent city.” He then transitioned to become a major force behind the development and initial operation of Eglin’s Armament Museum as its first Director. He retired from the Air Force in 1980. In 1979 Ed and Carolyn became rare full-time residents on the beaches of 30A in South Walton. Ed had a litany of responsibilities during the next 35 years, including an instructor at Troy University’s FWB campus, an owner of a small gift and ice cream store on highway 98, a volunteer fire fighter, a member of the Code Enforcement Board, a Deacon of Santa Rosa Beach Community Church, the unofficial sheriff of Beach Highlands for years when there were few year-round residents, and the manager of the Santa Rosa Beaches Historic Gulf Cemetery. Ed became permanently sober in October 1987 and was a founding member of the Buster’s group of AA. He dedicated a special part of his last 30 years to the AA groups in the Santa Rosa area and there are few members that haven’t been touched by his presence and his firm but generous spirit during that time. Ed is survived by his wife of 65 years Carolyn, who taught over a decade at Niceville HS, daughter Lisa (John Boushy) of Santa Rosa Beach, son Brett (Karen) of Shalimar, and daughter Susan (Walter Johnson) of Jackson, MS; grandchildren Brandon, Jennifer, Kevin, Phillip (Amanda), Michael and Lauren (Alex); Blake and Brice; and Calvin and Erin, and one great grandchild, Kennedy, daughter of Blake. Ed was predeceased by his three sisters, Pat Burnham, Carmen Callan and Mary Rowell. A memorial service will be held on Saturday, August 18, at 10:00 am at Santa Rosa Beach (SRB) Community Church with Pastor Pete Hyde presiding. Interment with military honors will follow at SRB Historic Gulf Cemetery. A reception will follow at the SRB Community Church Fellowship Hall from about noon until 1 pm. Anyone wanting to express sympathy may make a donation in Ed’s name to http://www.southwaltonturtlewatch.org or to the Camel Club of SRB (Facebook). If preferred, flowers are also welcome. Please feel free to sign the guestbook, express condolences and share memories.